I’m in summertime state of mind. In just about 30 days, I'll be headed to Florida and all I've been doing is shopping online for items to add to my family vacation. Looking for summer hues like beachy tones, white, soft pinks and comfort! Dresses that are perfect from the beach to Disney. I think it's good to have a mix of shoe choice just to be safe. My husband and I always get a chance to get away for an evening while my mother-in-law watches are son. 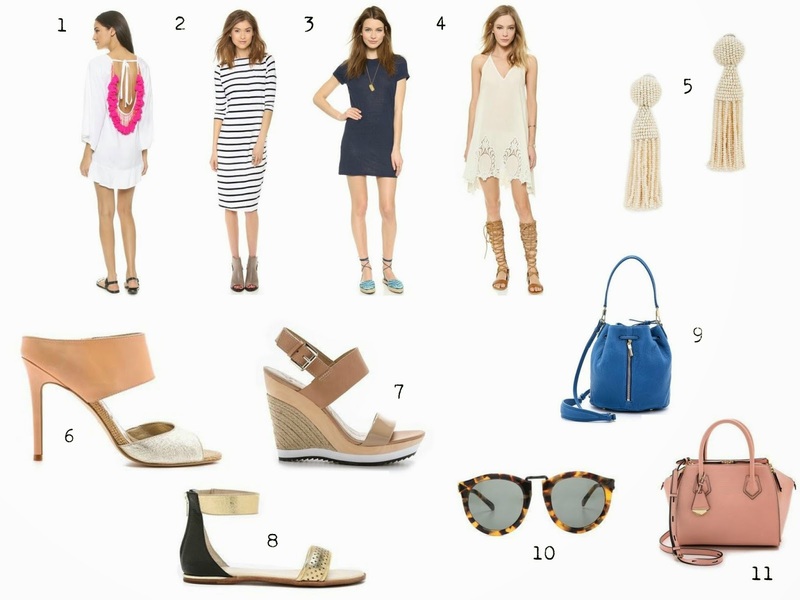 Mule sandals, wedges and flats are a good choice to have with you! When it comes to handbags, I try to carry light since I have my diaper bag with me at all times, so a mini bag is the perfect accessory to have that will carry what you need. Sunglasses! I think this one is self-explanatory. A cute statement earring that can go with multiple outfits to freshen things up! Any tips or things you do before you travel?